Having a small bedroom leaves you no choice but being creative. You can’t just toss everything in your bedroom and closet because you’ll end up making a messy bedroom. Who would stay and sleep in such a disaster area? The best way to tackle the storage-space problem in a small bedroom is by investing in multi-purpose furniture. There are many pieces of furniture that function as a place to store things as well as ensuring your ultimate comfort, just like this bench. This white bench looks like an ordinary bench. But if you remove the bench pads, you’ll find a cabinet that you can use to stash anything you want so the clutter will be out of sight, and your bedroom will be extremely neat. Besides, you’ll get a comfy white bench by the window where you can curl up while enjoying the view. You can get this bench in the home improvement store near you. But if you want it to match the interior, the best way to realize it is by DIYing it. You only need to make two large boxes, install piano hinges for the doors, and paint it the color that suits the décor well. More info 1 and 2. In a tiny bedroom, every inch count. Don’t miss the opportunity to optimize the available storage space that lies dormant in your bedroom. Even your door can make a pretty good vertical storage space. There are plenty of materials you can use to make a vertical storage space such as wire racks and shoe organizers. Just hang it behind your door and make it hold your stuff in place. Now, you have an epic closet right behind the door. A closet is the best place to store your clothes and other fashion items. Unfortunately, your bedroom is too small to have a walk-in closet. Purchasing a wardrobe isn’t possible either because it will take up a lot of your bedroom space. Try availing the versatility of stainless-steel single rod drying racks in place of a bulky wardrobe. They function as well as a wardrobe, but they are slimmer and save more space. Above the drying racks is a wall-mounted shelf. It is installed close to the ceiling so it can draw your attention up to the ceiling, making the bedroom appear to be larger. To make our point clearer play this little video. I think they are very relevant with our discussion. Pegboards can always make a nice additional storage solution for a room with limited space, including your bedroom just like what you can see here. A pegboard hangs next to the headboard, allowing you to reach it easily. Install some standard hardware hooks so you can hang photographs and outfit that you’re gonna wear for the next day. You can also make a simple shelf or small organizer functioned as a charging station if there is an outlet nearby. Besides being a great storage solution, this blue pegboard also makes a great adornment that complements the table lamp and bed cover well. Many homeowners think that by keeping the furniture low like ditching the bed frame, will make the bedroom look more spacious, but that’s not always the case. Raising your bed a few inches off the ground would maximize the storage space in your small bedroom. Shoving your bed against the wall enables you to have a spacious space in the middle of your bedroom so you can practice your yoga pose comfortably. But what about the storage organizers? Well, you need to shove them, too. To make it happen, you need to invest in a twin bed or daybed. A daybed usually comes with some drawers underneath, which is a precious thing for a space-challenged bedroom. Besides the drawers, install some wall-mounted shelves to store your books. By doing this, you’ll keep your bedroom tidy. Living in a small house or apartment doesn’t allow you to have more bedrooms, let alone a game room. For this reason, some kids have to play in their bedroom. As a result, the bedroom has been invaded by clutter. Do you enjoy reading a book on your bed before sleeping? It means you need a reading corner in your bedroom. However, having a nightstand in such a limited space will make your bedroom look more cramped. Instead of buying a nightstand, why don’t you make your own space-friendly nightstand? Making this corner nightstand is very easy. You just need to get a board or anything with flat surface like a cabinet door, L brackets, screws, and drywall anchors. You are lucky if you can still have a wardrobe or closet in your bedroom. But it doesn’t mean that you can feel relax now. Wardrobe, closet, and drawers are meant to keep the clutter at bay. Ironically, they are the comfortable places for clutter to stay. Now, it’s time to tidy up your wardrobe. It’s simple. Just get some organizers from IKEA or Amazon, and put them in your wardrobe. Don’t forget to put on a label on each organizer so you can find what you’re looking for easily. To tidy up your drawers, you can re-purpose gift boxes or some cardboard to create some compartments inside the drawer. More about IKEA organizations. Some people think that getting rid of the headboard is a great solution for a small bedroom. Well, not really! In fact, you can still put some style as well as adding a storage space by keeping the headboard. 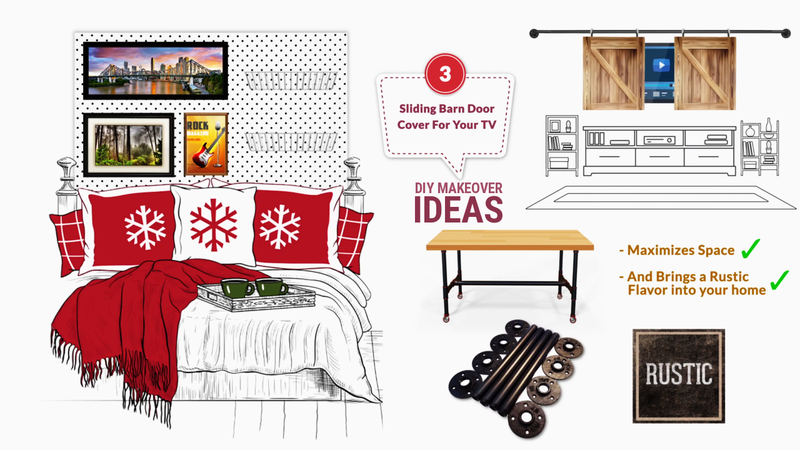 You can get a headboard with built-in shelves from a home improvement store. But if you think it doesn’t suit your bed well, you can always make it yourself. So, Those are 10 storage organizer ideas for your small bedroom. The most important thing is you need to make use every nook and cranny to optimize the storage space. Once your bedroom is clutter-free, you can achieve the ultimate comfort. Additional Credit for video 1.